Photo borrowed from Pynchon in Public. a secret richness and concealed density of dream…a network by which X number of Americans are truly communicating whilst reserving their lies, recitations of routine, arid betrayals of spiritual poverty, for the official government delivery system. For here were God knew how many citizens, deliberately choosing not to communicate by US Mail. It was not an act of treason, nor possibly even of defiance. But it was a calculated withdrawal, from the life of the Republic, from its machinery. Whatever else was being denied them out of hate, indifference to the power of their vote, loopholes, simple ignorance, this withdrawal was their own, unpublicized, private. So far, so libertarian. The novel involves a complex metaphor which can be and has been picked apart in various ways*. Here I want to focus on communication in relation to the private and the State. As the reference to a computer suggests, Neoliberalism has realised Oedipa’s dream, in the form of the internet, also a long-term concern of Pynchon. Is it free or controlled, radical or repressive? Is Tristero the heterotopian deep, dark web, as explored in ‘Bleeding Edge’ (2013), or is it Google, Facebook and Whatsapp? At a certain point it contained the potential to be both, and Pynchon explores those historical moments, unearthing the buried wires that could have gone in all sorts of directions. While it’s hard to imagine a centrally-managed and state-owned internet, it’s not hard to remember when the postal service was run in such a way. When I was growing up there was a single state-owned postal network in the UK. If you wanted to post a letter or parcel, you went to the post office, and receiving post was a matter of waiting until a postman or woman, employed by the same organisation, turned up in the morning. It wasn’t perfect: sometimes he or she would be late, very occasionally missives wold go missing, there was no internet so you couldn’t ‘track’ what you’d sent, and often – horror of horrors – you had to stand in a queue at the post office itself, but on the whole the system functioned well. I never remember any of my friends or family suggested we scrap the whole thing and replace it with chaos. With the ‘liberalisation’ of postal services around Europe and some other parts of the world, the sending and receiving of physical objects has, rather than being ‘liberated’, become immensely more inefficient and time-consuming. The fact that certain neoliberals love to boast about ‘disrupting‘ settled industries is exemplified in the amount of hassle involved in identifying which kinds of stamps can go in which kinds of post boxes, staying at home all day in the vain hope that whichever bunch of shysters has been entrusted with your package might deign to turn up at whatever time best suits their employers, calling round two or three mobile phone numbers in the hope that whichever subcontracted individual (working for a subcontracted subunit of a global cartel) has your parcel is still awake and hasn’t flown away to Ibiza for two weeks. By contrast, Oedipa’s system of wandering round the Bay Area all night on the lookout for tramps dumping handfuls of letters into posthorn-marked dustbins starts to look like a far more efficient and reliable system. Still, onwards and upwards. Far more important than the need of ordinary people to dispatch and obtain goods and gifts is the sacrosanct desire of ‘entrepreneurs‘, those modern-day counterparts of Jay Gould, to profit by acting as entirely unnecessary middlemen (or perhaps that should be highwaymen) in any inter-human transaction. 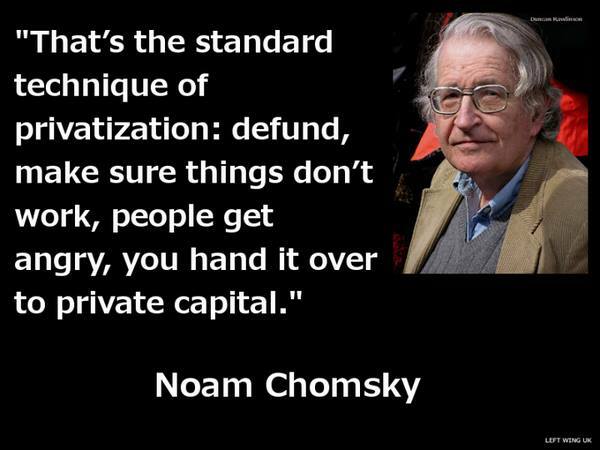 Following on from EU-wide deregulation, both Royal Mail and Poste Italiane are currently being privatised, after years of having been, in accordance with Noam Chomsky’s prognosis, run into the ground. For someone who comes from the UK and now lives in Italy, questa non è una buona notizia. At a generous estimate, 30% of things that have been dispatched to us in Rome over the last few months of friends and family generously dispatching gifts for our new baby simply haven’t arrived. Others have taken months to turn up. On occasion, tracked packages have apparently arrived at the nearest delivery centre and sat there forlornly for several weeks despite my increasingly bad-tempered exhortations to the people personning the Poste Italiane Facebook page to ask someone to pick them up and bring them to the address written on the cazzo label. At one point I posted them a link to the Italian Wikipedia page about the film ‘Il Postino’, so at least they might understand what the purported function of their organisation was. A volta la ironia si perde nella traduzione. Last month, the pursuit of a tardy passport delivery occasioned a visit to the local sorting office. Having negotiated the security system (bloke enjoying a ciggy, listens to my garbled explanation and nods me through) I made my way upstairs into a huge room contained what looked like avenues of undelivered parcels. It seemed to be a mausoleum of things that could be delivered, but probably won’t be. Like with gravestones, the names chiseled, printed or handwritten with misplaced optimism on the envelopes marked only a permanent resting place. Excitingly, on the other hand, it appeared that I could wander round and pick things up – I might even happen upon the parcel of baby clothes my sister sent over a month ago! Perhaps I would come across that book of poetry I’d ordered from a US website three months ago, or the TRUCK FUMP! t-shirt my wife had bought as a Christmas present! Sadly, given the enormous piles of pacchi in ritardo mounted up around the warehouse, untroubled by the attentions of the few yellow-tabarded staff standing around in a desultory fashion waiting for lunchtime, it seemed unlikely. It would have been like looking for a needle in a deregulated haystack. Maybe I should have just asked them to send the parcels via W.A.S.T.E. *Pynchon later expressed dissatisfaction with the novel: “I seem to have forgotten most of what I thought I’d learned up until then”. The timeline is the spring of 1964, before pentecost. If the 1964 of The Crying of Lot 49 seems like 1966, note how late in the book Mucho goes on about the Beatles in “She Loves You”—you think he was rambling about “Tommorow Never Knows”, maybe that’s the point. LSD was all about the CIA in 1964, thus the psychiatric scene around Stanford in CoL49—1964 was when the Luces were keen on the wonder drug and “Operation Midnight Climax” was in full swing.The central subtext of CoL49 is the CIA. Doctor Hiliarus is exhibit “A” for “Operation Paperclip”. I am an ex-pat living in Italy also, and I can support your opinion of the Italian postal system. It is a catastrophe! Most Italians will agree, but no one does anything. I have travelled quite a bit and I can say that the only postal system I have ever come across that more or less equals the ineptitude of the Italian is the Indian. And while in India the sending of material is at least as bad as in Italy, the recieving end of it is much better. In terms of bureaucracy Italy is still barely a third world country. In all of this there seems to be a parallel to Pynchon’s Trystero. In Italy you can put your mail in ‘WASTE’ and forget about it, or hope that there is some underground system that might someday help you to transmit comunications outside the government bureaucracy. And not to forget about the Italian origins of Trystero. Pynchon surely must have spent some time here.